How do you curate an exhibition about a person whose most important contribution to fashion is herself rather than anything quantifiable and tangible that could be captured with mere objects? This was the problem given to curators Alistair O’Neill and Shonagh Marshall in putting together the Isabella Blow: Fashion Galore! 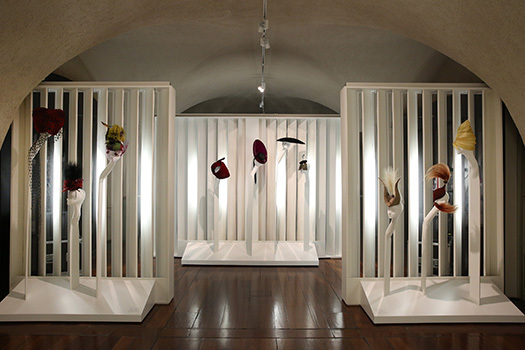 exhibition, currently on display at Somerset House until 2nd March 2014. 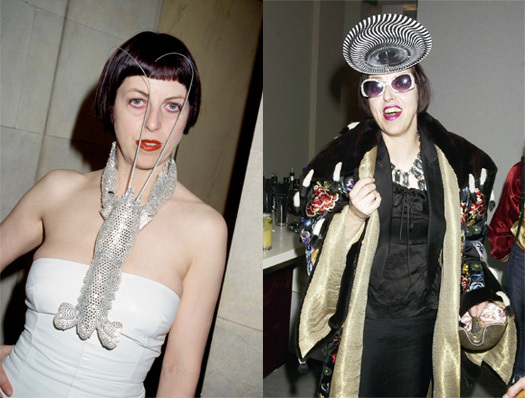 Isabella Blow was an influential fashion fancy-dresser and a real cultural force as an editor and muse. During her career, which lasted but a few decades from the late 1980’s onwards, Blow’s name wandered through various fashion magazine and newspaper mastheads – the Vogues, the Tatlers and the Times – where she directed fashions and shaped agenda around it. But whilst her work for these publications is less well recognised, Blow’s real credit came from discovering the next big things- whether a model, a talent, a mood or a trend. She catapulted designers such as Alexander McQueen[ref]She bought his graduate collection straight off the runway and paid for it in monthly instalments. [/ref], Julien Macdonald, Hussein Chalayan and milliner Philip Tracey into the fashion industry and was first to use models such as Stella Tennant, Sophie Dahl and Honor Fraser. Sadly, Blow took her own life in May 2007, after years of suffering from depression. As well as her close association with McQueen, it is her outrageous dress sense that will remain her legacy. Images of Blow wearing the Phillip Tracey lobster or the gigantic disc hats, the historic gowns and armoury along with creations by her protégés are her most memorable contributions to fashion’s shared memory. The starting point to this exhibition is her estate, auctioned after her death by Christie’s and bought in its entirety by British beer heiress Daphne Guinness in an attempt to preserve Blow’s legacy. The exhibition itself consists of a multitude of related, yet ill-connected elements. As with any exhibition based around a person, the formula includes a bit of the personal and the professional. 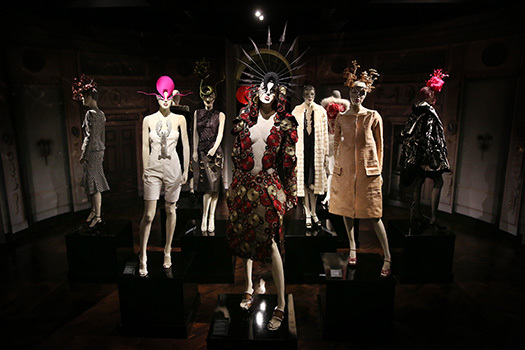 The result is a scattering of garments by designers Blow discovered, film clips, some family photographs and odd memorabilia like her Rolodex whilst most part of the exhibition consists of Blow’s extensively extravagant wardrobe. 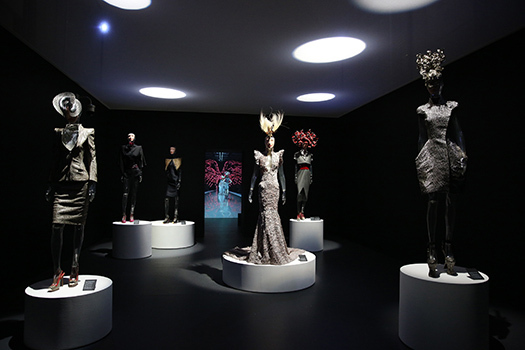 Isabella Blow’s talent was in creating fantasy, most of which she projected through herself by dressing up. In the era before the flurry of streetstyle photographers and streetstyle performers such as stylist/personality Anna de la Russo blogger/poser Brynboy, Blow was one of a kind and authentically bonkers in her approach. [ref]…in a way that only a Brit could! [/ref] Sadly, the remains of her wardrobe do nothing in alighting the spirit of her being. In fact without Blow, the garments on display are as good at projecting magic as those in the windows of John Lewis. Rather than an exhibition about the spirit of Blow, Fashion Galore gives an adequate overview of British fashion from Nineties and early part so the 21st century through the lens of Blow’s wardrobe. 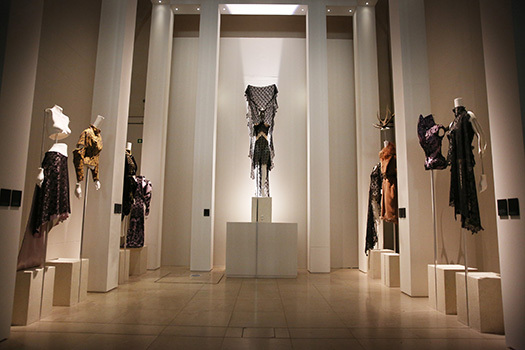 Here, McQueen’s graduate collection – which was not on display at the Savage Beauty exhibition about the designers work – is one of the unseen highlights. Phillip Tracey’s hats have also been given a sizable amount of space. Beyond this, it is hard to imagine someone unfamiliar with Blow or the context of her presence walking around the exhibition and really getting anything from it. It is unfair for me the say that the curators have failed in putting this exhibition together and in capturing Isabella Blow – it was a flawed concept from the offset. No matter how much stuff – and I mean stuff – there is in the exhibition, the magic has been lost in the curatorial process. The unforgiving Embankment Gallery setting has made the work of the curators even more difficult as the space with its awkward layout, offshoot rooms and lack of stylistic consistency contribute to the confusion. Perhaps it was far too early to stage an exhibition about Blow. Time provides the much-needed distance/absence to make a heart grow fonder. For those of you contemplating on going to see the exhibition, I suggest you do. Just don’t expect it to tell you much about Isabella Blow. Personally, I found the many books written about her (not by her) better in capturing an aspect of who she was. 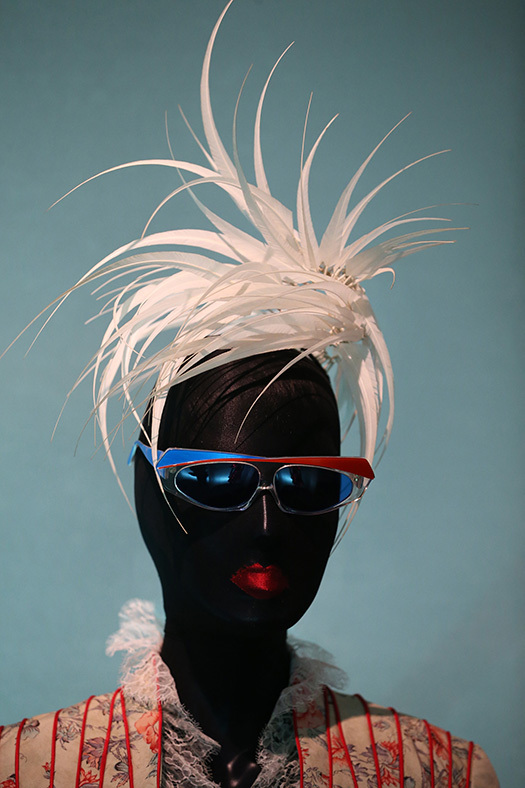 [ref]Biographies include Isabella Blow: A Life in Fashion by Lauren Goldstein Crowe, Blow by Blow by Isabella’s husband Detmar Blow and picture books such as Isabella Blow by Martina Rink. Of course time was against most of these books as well, and the first two were notably overshadowed the war of words between Crowe and Blow. [/ref] It is the imagination need to bring a biography to life and whether accurate or not, it’s the perhaps best way to serve her legacy for now without the need for the remains of her wardrobe and attic to be on display.